Eucalyptus oil is used in Natural Skin Care Products for its ability to reduce redness and irritation of the skin. Eucalyptus oil is harvested from the leaves of the Eucalyptus tree, a native to Australia. The Eucalyptus tree (Eucalyptus globulus) is a medium to very tall forest tree which may reach 70 metres in ideal conditions but is more commonly 15-25 metres in height. The tree has a rough, greyish bark which is shed on the upper trunk and branches in long ribbons and has white flowers from winter to early summer (southern hemisphere). They are followed by greyish, 3 to 5-valved fruits ("gum nuts"). Other Names: Blue Gum; Eucalyptus dives - Peppermint Gum; Eucalyptus citriodora - Lemon-scented gum; Eucalyptus smithii - Gully gum; Eucalyptus olida - Strawberry gum; Eucalyptus radiata - Australian Eucalyptus. Eucalyptus Oil is known throughout the world for its use as a decongestant in colds and influenza. The genus Eucalyptus is endemic to the southern hemisphere and is part of the large Myrtaceae Family of plants. Eucalyptus oil possesses a high content of 1, 8-cineole, a compound used to enrich other oils. Cineole has a density of only 0.93, so it floats on water. The essential oil of Eucalyptus is extracted by steam distillation from the leaves and stems primarily. 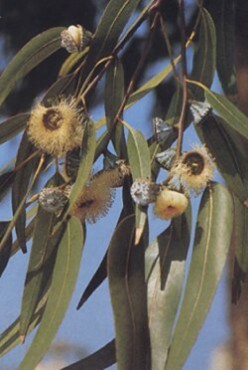 Cineole exists in the oil dots within the leaves of the Eucalypt. There are many species of Eucalyptus from which essential oils can be obtained and each species produces oils with slightly different properties. It has a cleansing effect on the skin and reduces redness and irritation. 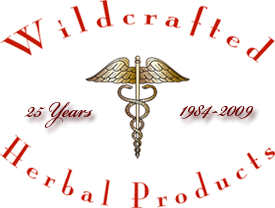 Eucalyptus oil is reputed to aid in wound healing and is antispetic and anti-parasitic. Eucalyptus oil has many other uses in addition to being a chief remedy in the treatment of colds and influenza. It helps relieve tension and stress, with a relaxing effect on the nervous system and is said to reduce the pain associated with rheumatism and gout. The aroma of Eucalyptus oil is very uplifting, over coming tiredness and aiding concentration. Peppermint Gum and Blue Gum varieties of Eucalyptus oil can be found in Wildcrafted’s Refreshing Massage Oil Blend, Active Body Massage Oil Blend and the Native Australian Hydro Oil Blend.